A few months after demonstrating its dominance over the game of Go, DeepMind’s AlphaZero AI has trounced the world’s top-ranked chess engine—and it did so without any prior knowledge of the game and after just four hours of self-training. AlphaZero is now the most dominant chess playing entity on the planet. In a one-on-one tournament against Stockfish 8, the reigning computer chess champion, the DeepMind-built system didn’t lose a single game, winning or drawing all of the 100 matches played. AlphaZero is a modified version of AlphaGo Zero, the AI that recently won all 100 games of Go against its predecessor, AlphaGo. In addition to mastering chess, AlphaZero also developed a proficiency for shogi, a similar Japanese board game. This latest achievement underscores the system’s versatility and ability to acquire superhuman levels of competency in rule-based domains. The system works nearly identically to AlphaGo Zero, but instead of playing Go, the machine is programmed to play chess and shogi. Impressively, AlphaZero acquired its expertise with no outside help, and with no prior empirical data, such as a database of archived chess games, or well-known chess strategies and openings. Essentially, AlphaZero acquired 1,400 years of human chess knowledge—and then some—on its own, and in a ludicrously short amount of time. 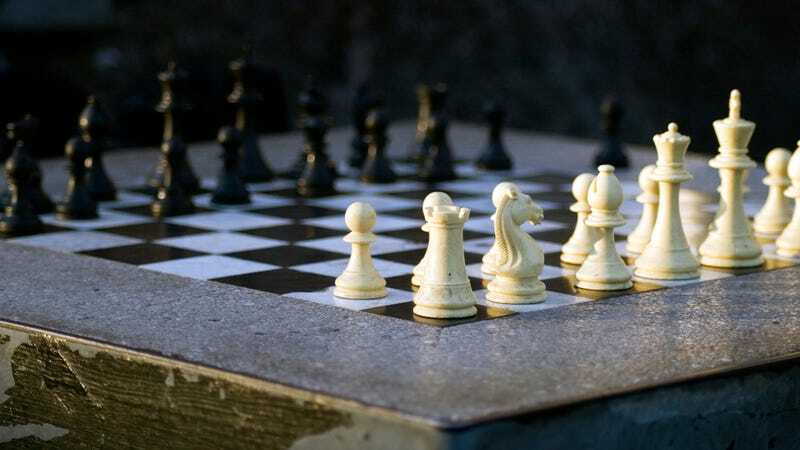 AlphaZero acquired the expertise to defeat Stockfish 8 in four hours, and AlphaGo in eight hours, according to the accompanying paper, which has yet to go through peer view. Some publications are reporting that AlphaZero “taught itself how to play [chess] in under four hours,” but that’s not entirely accurate. Rather, AlphaZero learned how to dominate chess in just a few hours. When the exercise starts, AlphaZero already knows how to play chess—just not very well. The system is armed with the rules to the game, but it has zero chess playing experience. Starting from a blank slate, and armed with nothing more than a reinforcement learning algorithm, a neural net, and the pieces on the board for input, AlphaZero plays itself over and over again, refining its skills with each passing match. The system can churn out 800,000 positions each second, as compared to Stockfish 8's 70 million moves a second. In its one-on-one tournament against Stockfish 8, AlphaZero won 25 games and tied 25 when it played as white, while winning three and drawing 72 games when playing as black—a fascinating result for chess theorists who have long known about white’s supreme first mover advantage. AlphaZero’s favorite openings included the English Opening, the Queen’s Gambit (my personal favorite), and the Queen Pawn Game. AlphaZero was also pitted against its sibling, AlphaGo, which was also modified to play chess. After eight-hours of self-play, it amassed a record of 60 wins and 40 losses against the digital old-timer. AlphaZero’s victory over Stockfish 8 has rocked chess experts, who are now wondering if traditional “minimax” chess engines, such as Stockfish 8 and Elmo (another chess engine that got trounced by AlphaZero), are now obsolete. Only time will tell. Perhaps obviously, AlphaZero’s dominance in chess is less impressive than its mastery over Go—a game that’s significantly more complex. Indeed, expert chess bots have been defeating the best human players ever since IBM’s Deep Blue supercomputer defeated Garry Kasparov in 1997. But this achievement is impressive in that the same system and computational architecture used to win at Go was leveraged for use in other domains, namely chess and shogi. This is an important point because AlphaGo has been criticized for being too narrow. Unlike a more generalized intelligence, this expert system is really good at doing one thing and one thing only—a far cry from how human intelligence works. But by adapting the system to learn a new set of rules for an entirely new game, the DeepMind developers demonstrated the flexibility of the system and (possibly) its potential to work outside of mere gameplay. Eventually, this system, and others like it, could be used in more “real world” settings, where it could master a number of rule-based domains, such as finance and scientific discovery. Correction: A previous version of this post stated that AlphaZero won all 25 games as white. Rather, it won 25 and drew 25 as white.